"DC-3" redirects here. For other uses, see DC-3 (disambiguation). The Douglas DC-3 is a fixed-wing propeller-driven airliner that revolutionized air transport in the 1930s and 1940s. Its lasting effect on the airline industry and World War II makes it one of the most significant transport aircraft ever produced. It has a cruise speed of 207 mph (333 km/h), capacity of 21 to 32 passengers or 6,000 lbs (2,700 kg) of cargo and a range of 1,500 mi (2,400 km). The DC-3 is a twin-engine metal monoplane with a tailwheel-type landing gear and was developed as a larger, improved 14-bed sleeper version of the Douglas DC-2. It had many exceptional qualities compared to previous aircraft. It was fast, had good range and could operate from short runways. It was reliable and easy to maintain and carried passengers in greater comfort. Before the war it pioneered many air travel routes. It could cross the continental United States and made worldwide flights possible. It is considered the first airliner that could profitably carry just passengers. Civil DC-3 production ended in 1942 at 607 aircraft. Military versions, including the C-47 Skytrain (designated the Dakota in British Royal Air Force (RAF) service), and Russian- and Japanese-built versions, brought total production to over 16,000. Following the war, the airliner market was flooded with surplus C-47s and other ex-military transport aircraft, and Douglas' attempts to produce an upgraded DC-3 failed due to cost. Post-war, the DC-3 was made obsolete on main routes by more advanced types such as the Douglas DC-6 and Lockheed Constellation, but the design proved exceptionally adaptable and useful. Large numbers continue to see service in a wide variety of niche roles well into the 21st century. In 2013 it was estimated that approximately 2,000 DC-3s and military derivatives were still flying, a testament to the durability of the design. "DC" stands for "Douglas Commercial". The DC-3 was the culmination of a development effort that began after an inquiry from Transcontinental and Western Airlines (TWA) to Donald Douglas. TWA's rival in transcontinental air service, United Airlines, was starting service with the Boeing 247 and Boeing refused to sell any 247s to other airlines until United's order for 60 aircraft had been filled. TWA asked Douglas to design and build an aircraft that would allow TWA to compete with United. Douglas' design, the 1933 DC-1, was promising, and led to the DC-2 in 1934. The DC-2 was a success, but there was room for improvement. The DC-3 resulted from a marathon telephone call from American Airlines CEO C. R. Smith to Donald Douglas, when Smith persuaded a reluctant Douglas to design a sleeper aircraft based on the DC-2 to replace American's Curtiss Condor II biplanes. 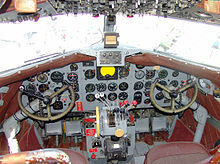 (The DC-2's cabin was 66 inches (1.7 m) wide, too narrow for side-by-side berths.) Douglas agreed to go ahead with development only after Smith informed him of American's intention to purchase twenty aircraft. The new aircraft was engineered by a team led by chief engineer Arthur E. Raymond over the next two years, and the prototype DST (Douglas Sleeper Transport) first flew on December 17, 1935 (the 32nd anniversary of the Wright Brothers' flight at Kitty Hawk). Its cabin was 92 in (2.3 m) wide, and a version with 21 seats instead of the 14–16 sleeping berths of the DST was given the designation DC-3. There was no prototype DC-3; the first DC-3 built followed seven DSTs off the production line and was delivered to American Airlines. The DC-3 and DST popularized air travel in the United States. Eastbound transcontinental flights could cross the U.S. in about 15 hours with three refueling stops; westbound trips against the wind took ​17 1⁄2 hours. A few years earlier such a trip entailed short hops in slower and shorter-range aircraft during the day, coupled with train travel overnight. 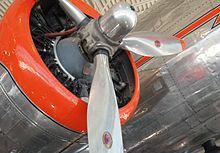 A variety of radial engines were available for the DC-3. Early-production civilian aircraft used Wright R-1820 Cyclone 9s, but later aircraft (and most military versions) used the Pratt & Whitney R-1830 Twin Wasp, which gave better high-altitude and single-engine performance. Five DC-3S Super DC-3s with Pratt & Whitney R-2000 Twin Wasps were built in the late 1940s, three of which entered airline service. 487 Mitsubishi Kinsei-engined aircraft built by Showa and Nakajima in Japan (1939–1945), as the L2D Type 0 transport (Allied codename Tabby). Production of DSTs ended in mid-1941 and civil DC-3 production ended in early 1943, although dozens of DSTs and DC-3s ordered by airlines that were produced between 1941 and 1943 were impressed into the US military while still on the production line. Military versions were produced until the end of the war in 1945. 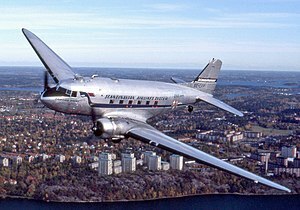 A larger, more powerful Super DC-3 was launched in 1949 to positive reviews. The civilian market, however, was flooded with second-hand C-47s, many of which were converted to passenger and cargo versions. Only five Super DC-3s were built, and three of them were delivered for commercial use. The prototype Super DC-3 served the U.S. Navy with the designation YC-129 alongside 100 R4Ds that had been upgraded to the Super DC-3 specification. From the early 1950s, some DC-3s were modified to use Rolls-Royce Dart engines, as in the Conroy Turbo Three. Other conversions featured Armstrong Siddeley Mamba and Pratt & Whitney PT6A turbines. The Greenwich Aircraft Corp DC-3-TP is a conversion with an extended fuselage and with Pratt & Whitney Canada PT6A-65AR or PT6A-67R engines fitted. The Basler BT-67 is a conversion of the DC-3/C-47. Basler refurbishes C-47s and DC-3s at Oshkosh, Wisconsin, fitting them with Pratt & Whitney Canada PT6A-67R turboprop engines, lengthening the fuselage by 40 in (100 cm) with a fuselage plug ahead of the wing and strengthening the airframe in selected areas. BSAS International in South Africa is another company able to perform a Pratt & Whitney PT6 turboprop conversion of DC-3s. Over 50 DC-3/C-47s / 65ARTP / 67RTP / 67FTPs have been modified. Conroy Aircraft also made a three-engined conversion with Pratt & Whitney Canada PT6 called the Conroy Tri-Turbo-Three. American Airlines inaugurated passenger service on June 26, 1936, with simultaneous flights from Newark, New Jersey and Chicago, Illinois. Early U.S. airlines like American, United, TWA, Delta and Eastern ordered over 400 DC-3s. These fleets paved the way for the modern American air travel industry, which eventually replaced trains as the favored means of long-distance travel across the United States. A nonprofit group, Flagship Detroit Foundation, continues to operate the only original American Airlines Flagship DC-3 with air show and airport visits throughout the U.S. In 1936, KLM Royal Dutch Airlines received its first DC-3 (in 1943 it was downed by Luftwaffe fighters while on a scheduled passenger flight), which replaced the DC-2 in service from Amsterdam via Batavia (now Jakarta) to Sydney, by far the world's longest scheduled route at the time. In total, KLM bought 23 DC-3s before the war broke out in Europe. In 1941, a China National Aviation Corporation (CNAC) DC-3 pressed into wartime transportation service was bombed on the ground at Suifu airfield in China, completely destroying the right wing. The only spare wing available was that of a smaller Douglas DC-2 being overhauled in CNAC's workshops. The DC-2's right wing was taken off, flown to Suifu under the belly of another CNAC DC-3, and grafted to the damaged aircraft. After a single test flight, in which it was discovered that it pulled to the right due to the difference in wing sizes, the so-called DC-2½ was returned to service. Cubana de Aviación became the first Latin American airline to offer a scheduled service to Miami when it started its first scheduled international service from Havana to Miami in 1945 with a DC-3. Cubana used DC-3s on some domestic routes well into the 1960s. Piedmont Airlines operated DC-3s and C-47s from 1948 to 1963. A DC-3 painted in the representative markings of Piedmont, operated by the Carolinas Aviation Museum, was retired from flight in March 2011. Both Delta Air Lines and Continental Airlines once operated commemorative DC-3s wearing period markings. During World War II, many civilian DC-3s were drafted for the war effort and just over 10,000 U.S. military versions of the DC-3 were built, under the designations C-47, C-53, R4D, and Dakota. Peak production was reached in 1944, with 4,853 being delivered. 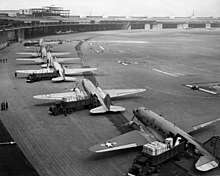 The armed forces of many countries used the DC-3 and its military variants for the transport of troops, cargo, and wounded. Licensed copies of the DC-3 were built in Japan as the Showa L2D (487 aircraft); and in the Soviet Union as the Lisunov Li-2 (4,937 aircraft). Thousands of surplus C-47s, previously operated by several air forces, were converted for civilian use after the war and became the standard equipment of almost all the world's airlines, remaining in frontline service for many years. The ready availability of cheap, easily maintained ex-military C-47s, both large and fast by the standards of the day, jumpstarted the worldwide postwar air transport industry. While aviation in prewar Continental Europe had used the metric system, the overwhelming dominance of C-47s and other U.S. war-surplus types cemented the use of nautical miles, knots and feet in postwar aviation throughout the world. Douglas developed an improved version, the Super DC-3, with more engine power, greater cargo capacity and a different wing, but with all the bargain-priced surplus aircraft available, they did not sell well in the civil aviation market. Only five were delivered, three of them to Capital Airlines. The U.S. Navy had 100 of its early R4Ds converted to Super DC-3 standard during the early 1950s as the R4D-8, later C-117D. The last U.S. Navy C-117 was retired July 12, 1976. The last U.S. Marine Corps C-117, serial 50835, was retired from active service during June 1982. Several remained in service with small airlines in North and South America in 2006. A number of aircraft companies attempted to design a "DC-3 replacement" over the next three decades (including the very successful Fokker F27 Friendship), but no single type could match the versatility, rugged reliability and economy of the DC-3. It remained a significant part of air transport systems well into the 1970s. A 1944 Douglas DC-3C starting its engines and taxiing with its tail wheel unlocked (2015). Perhaps unique among prewar aircraft, the DC-3 continues to fly daily in active commercial and military service as of mid 2018, more than eighty years after the type's first flight in 1935. There are still small operators with DC-3s in revenue service and as cargo aircraft. 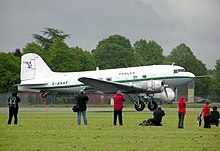 Current uses of the DC-3 include aerial spraying, freight transport, passenger service, military transport, missionary flying, skydiver shuttling and sightseeing. The very large number of civil and military operators of the DC-3/C-47 and related types makes a listing of all the airlines, air forces and other current operators impractical. The common saying among aviation enthusiasts and pilots is "the only replacement for a DC-3 is another DC-3." The aircraft's legendary ruggedness is enshrined in the lighthearted description of the DC-3 as "a collection of parts flying in loose formation". Its ability to use grass or dirt runways makes it popular in developing countries or remote areas, where runways are not always paved. The oldest surviving DC-3 is N133D, the sixth Douglas Sleeper Transport built, manufactured in 1936. This aircraft was delivered to American Airlines on July 12, 1936, as NC16005. As of 2011 the aircraft was at Shell Creek Airport, Punta Gorda, Florida, where it was undergoing restoration. The aircraft was to be restored to Douglas Sleeper Transport standards, and full airworthiness. The oldest DC-3 still flying is the original American Airlines Flagship Detroit (c/n 1920, the 43rd aircraft off the Santa Monica production line and delivered on March 2, 1937), which can be seen at airshows around the United States and is owned and operated by the nonprofit Flagship Detroit Foundation. The base price of a new DC-3 in 1936 was around $60,000–$80,000, and by 1960, used examples were available for $75,000. Douglas Sleeper Transport; the initial variant with two Wright R-1820 Cyclone engines and standard sleeper accommodation for up to 16 with small upper windows, convertible to carry up to 24 day passengers. Initial non-sleeper variant; with 21 day-passenger seats, 1,100-horsepower (820 kW) Wright R-1820 Cyclone engines, no upper windows. DC-3 with 1,200-horsepower (895 kW) Pratt & Whitney R-1830-21 engines. 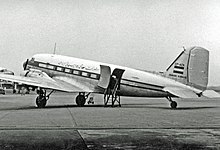 Version of DC-3 for TWA; with two Wright R-1820 Cyclone engines and smaller convertible sleeper cabin forward with fewer upper windows than DST. Designation for ex-military C-47, C-53 and R4D aircraft rebuilt by Douglas Aircraft in 1946, given new manufacturer numbers and sold on the civil market; Pratt & Whitney R-1830 engines. Designation for 28 new aircraft completed by Douglas in 1946 with unused components from the cancelled USAAF C-117 production line; Pratt & Whitney R-1830 engines. Also known as Super DC-3, substantially redesigned DC-3 with fuselage lengthened by 39 inches (1.0 m); outer wings of a different shape with squared-off wingtips and shorter span; distinctive taller rectangular tail; and fitted with more powerful Pratt & Whitney R-2000 or 1,475-horsepower (1,100 kW) Wright R-1820 Cyclone engines. Five completed by Douglas for civil use using existing surplus secondhand airframes. Three Super DC-3s were operated by Capital Airlines 1950–1952. Designation also used for examples of the 100 R4Ds that had been converted by Douglas to this standard for the U.S. Navy as R4D-8s (later designated C-117Ds), all fitted with more powerful Wright R-1820 Cyclone engines, some of which entered civil use after retirement from the military. The C-41 was the first DC-3 to be ordered by the USAAC and was powered by two 1,200 hp (895 kW) Pratt & Whitney R-1830-21 engines. It was delivered in October 1938 for use by United States Army Air Corps (USAAC) chief General Henry H. Arnold with the USAAC serial 38-502 and the passenger cabin fitted out in a 14-seat VIP configuration. The C-41A was a single VIP DC-3A (serial 40-070) supplied to the USAAC in September 1939, also powered by R-1830-21 engines; and used by the Secretary of War. The forward cabin converted to sleeper configuration with upper windows similar to the DC-3B. The C-48 was a single former United Air Lines DC-3A impressed into the USAAC. The C-48As were three impressed DC-3As with 18-seat interiors. C-48B was the designation given to sixteen impressed former United Air Lines DST-As used as air ambulances with 16-berth interiors. The C-48Cs were sixteen impressed DC-3As with 21-seat interiors. Various DC-3 and DST models; 138 impressed into service as C-49, C-49A, C-49B, C-49C, C-49D, C-49E, C-49F, C-49G, C-49H, C-49J and C-49K. Various DC-3 models, fourteen impressed as C-50, C-50A, C-50B, C-50C and C-50D. One impressed aircraft originally ordered by Canadian Colonial Airlines, had starboard-side door. DC-3A aircraft with R-1830 engines, five impressed as C-52, C-52A, C-52B, C-52C and C-52D. Two DC-3As impressed with 21-seat interiors. British Royal Air Force designation for impressed DC-3s. 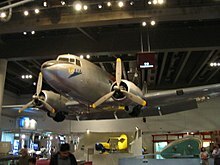 A single DC-3 supplied for evaluation by the Imperial Japanese Navy Air Service (IJNAS). Two Eastern Air Lines DC-3s impressed into United States Navy (USN) service as VIP transports, later designated R4D-2F and later R4D-2Z. Ten DC-3s impressed for use by the USN. Seven DC-3s impressed as staff transports for the USN. Radar countermeasures version of R4D-4 for the USN. for BEA test services, powered by two Rolls-Royce Dart turboprop engines. A single conversion for the Ministry of Supply, powered by two Armstrong-Siddeley Mamba turboprop engines. DC-3/C-47 engine conversion by Airtech Canada, first offered in 1987. Powered by two PZL ASz-62IT radial engines. DC-3/C-47 conversion with a stretched fuselage, strengthened structure, modern avionics, and powered by two Pratt & Whitney Canada PT-6A-67R turboprop engines. A South African C-47 conversion for the South African Air Force by Braddick Specialised Air Services, with two Pratt & Whitney Canada PT6A-65R turboprop engines, revised systems, stretched fuselage and modern avionics. One DC-3/C-47 converted by Conroy Aircraft with two Rolls-Royce Dart Mk. 510 turboprop engines. Same as the Turbo Three but converted from a Super DC-3. One converted. Conroy Turbo Three further modified by the removal of the two Rolls-Royce Dart engines and their replacement by three Pratt & Whitney Canada PT6s (one mounted on each wing and one in the nose). DC-3/C-47 conversion with a stretched fuselage, strengthened wing center section and updated systems; and powered by two Pratt & Whitney Canada PT6A-65AR turboprop engines. Douglas-built airframe fitted with Russian Shvetsov ASh-62 radial engines after World War II due to shortage of American engines in the Soviet Union. Similar to Ts-62, but with Shvetsov ASh-82 radial engines of 1,650 hp. A turboprop conversion by the United States Aircraft Corporation, fitting Pratt & Whitney Canada PT6A-45R turboprop engines with an extended forward fuselage to maintain center of gravity. First flight of the prototype conversion, (N300TX), was on July 29, 1982. Derivatives manufactured under license in Japan by the Nakajima Aircraft Company and Shōwa Aircraft for the IJNAS; 487 built. Derivatives manufactured under license in the USSR; 4,937 built. ^ a b Francillon 1979, pp. 217–251. ^ Rumerman, Judy. "The Douglas DC-3". Archived August 6, 2004, at the Wayback Machine U.S. Centennial of Flight Commission, 2003. Retrieved March 12, 2012. ^ Kathleen Burke (April 2013). "How the DC-3 Revolutionized Air Travel". Smithsonian. ^ Jonathan Glancey. "The Douglas DC-3: Still revolutionary in its 70s". BBC. ^ O'Leary 1992, p. 7. ^ May, Joseph (January 8, 2013). "Flagship Knoxville — an American Airlines Douglas DC-3". Seattle Post-Intelligencer blogs. Retrieved August 3, 2014. ^ Berths were 77 inches (2.0 m) long; lowers were 36 in (91 cm) wide and uppers were 30 in (76 cm). ^ Pearcy 1987, p. 17. ^ O'Leary 2006, p. 54. ^ a b Gradidge 2006, p. 20. ^ Turbo Dakota DC-3 "Turbine Conversion Aircraft". dodson.com. Retrieved September 12, 2012. ^ "Basler BT-67". Basler Turbo Conversions, LLC via baslerturbo.com, 2008. Retrieved March 7, 2009. ^ "BSAS International". www.bsasinternational.com. Retrieved October 11, 2011. ^ Holden, Henry. "DC-3 History". dc3history.org. Retrieved October 7, 2010. ^ a b "DC-3". Flagship Detroit Foundation. Retrieved October 7, 2010. ^ "CNAC'S DC-2 1/2" Retrieved November 8, 2016. ^ "The Seventies 1970–1980: C-117, p. 316". Archived 2013-05-13 at the Wayback Machine history.navy.mil. Retrieved August 10, 2010. ^ Gradidge 2006, pp. 634–637. ^ Glancey, Jonathan (October 10, 2013). "The Douglas DC-3: Still Revolutionary in its 70s". BBC. Retrieved January 21, 2017. ^ Williams, Michael (February 25, 2008). "How health and safety rules have grounded the Dakota, the war workhorse". Daily Mail. Retrieved March 7, 2009. ^ "Colombia's Workhorse, the DC-3 airplane". The Washington Post. Retrieved March 15, 2012. ^ "Douglas DC-3". Buffalo Airways. Retrieved October 22, 2012. ^ Moss, Frank. "World's Oldest DC-3". douglasdc3.com. Retrieved August 9, 2011. ^ "The de Havilland Aircraft Co. Ltd". Flight, November 18, 1960, p. 798. Retrieved September 12, 2012. ^ "Sleeping Car of the Air Has Sixteen Sleeping Berths". Popular Mechanics, January 1936. ^ "Aircraft Specifications NO. A-669". FAA. Retrieved October 20, 2011. ^ Gradidge 2006, pp. 632–633. ^ Pearcy, Arthur Douglas Propliners DC-1 – DC-7, Shrewsbury, England: Airlife Publishing Ltd., 1995, ISBN 1-8531026-1-X, pp. 93–95. ^ Gradidge 2006, pp. 634–639. ^ "Douglas C-41A". Archived 2008-09-07 at the Wayback Machine aero-web.org. Retrieved August 10, 2010. ^ Rickard, J. (November 11, 2008). "Douglas C-41A". historyofwar.org. Retrieved June 8, 2017. ^ "AirTech Company Profile". ic.gc.ca. Retrieved November 22, 2009. Holden, Henry M.. The Douglas DC-3. Blue Ridge Summit, Pennsylvania: TAB Books, 1991. ISBN 0-8306-3450-9. Kaplan, Philip. Legend: A Celebration of the Douglas DC-3/C-47/Dakota. Peter Livanos & Philip Kaplan, 2009. ISBN 978-0-9557061-1-0. O'Leary, Michael. When Fords Ruled the Sky (Part Two). Air Classics, Volume 42, No. 5, May 2006. 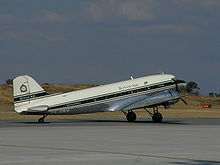 Wikimedia Commons has media related to Douglas DC-3.